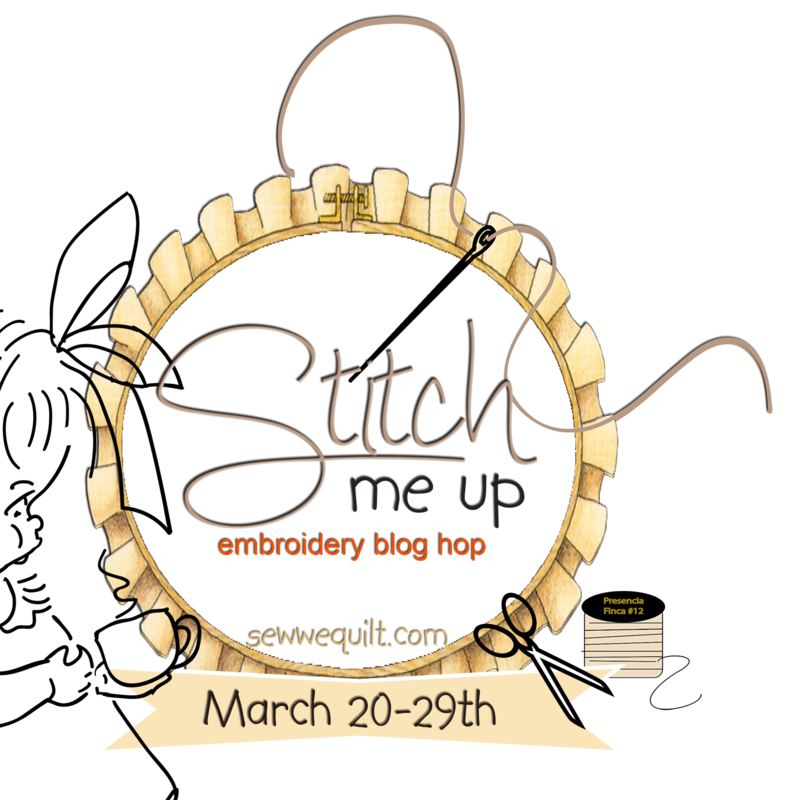 Welcome to my day for this wonderful blog hop. All the beautiful creations would not be happening but for the hard work of Madame Samm and Jane. Wonderful pattern designs by Debbie, Cyndi and Mdm Samm made choosing a project very difficult. Thank you all. Because I believe "TEA & STITCHES" always go together I began with this embroidery. I could not resist a Wee Tot. And then I found the paper dolls. When fussy cut they made perfect quilt partners. A Wee Tot should never be alone so I stitched her a friend. But they both love pink shoes. It was a difficult day to take outdoor pictures. Dare I admit that I still have an "old" doll around. It is hard to stop when stitching begins. This will become a cushion cover. I could not resist this embroidery. Perfect as we move into another season. Wishing you all a Happy Easter. Sew take a moment before you start stitching again, grab a cuppa tea and check out the other embroidery ladies on this hop. Love all your stitchery projects! Your wee tots quilt is adorable. Thank you for sharing. What a lovely quilt you made of the wee. Now that is a great quilt. Your tots are sweet! All your stitching is sew beautiful. Your quilt top with the dolls and tots is very cute. Nice job. you are so hardworking stitcher:-) Great quilt, and all the other embroideries as well! The quilttop is adorable, I love it! I love your stitcheries, thanks for showing, I wish you a happy Easter too! Love your tots and the doll fabric! Great combination! Thanks for sharing all of your stitchings! What beautiful projects. I love the wee tots quilt. As for the ironing one, it almost makes me want to iron! LOL! Have a happy Easter! I need to start drinking tea, it has made you so productive, loving all of your projects. I am having a cup of tea as I look through the wonderful stitching on all the blogs this wintery morning! Lovely quilt. 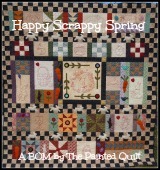 I love all your stitching and your quilt is absolutely charming! I still have dolls from my childhood too...since I'm 48, I don't think they will be going anywhere any time soon! Again, lovely job on your stitcheries! The quilt is so pretty! I have these little dolls and have been wondering what to do with them... Now I am inspired! I just love that quilt with the little dolls. It is amazing how the embroidered girls match the fabric. Thanks for sharing. What incredible stitching!!! They look just great. One should never apologize for having an "old doll". Great projects and beautiful stitching. Thanks for sharing! Your stitching is so beautiful...I love how you added the girls all together in a quilt! Your other little stitch projects are pretty amazing, too. Lovely stitching and project it is wonderful...have a super day. Your quilt is adorable! Great job! Your creations are marvelous! And the little bunnies at the end, cuter than cute. Oh my goodness, you were so busy! Love the Wee Tot with the paper dolls. and we all have a dolly somewhere, it is not just you and she is very pretty! Thank you for sharing all your work with us. Everything you stitched is darling but I love the quilt! Now your everything is amazing...love all your pics too...you just made us all smile this morning...enough warmth I would say to melt all that snow...take a peak over there.. Wonderful display Frances , the quilt is just charming !! Wow you have been busy - I like them all! Awesome quilt! You have been busy stitching! Thank you for sharing. Great job on the quilt and the other stitching! You have definitely been a busy beaver. Love your work. Love your work.You do such wonderful work. I can't believe I have read your blog off and on without being a follower. Well I follow you know. Your work is beautiful. I love your quilt. What a great idea. Someone is going to snuggle into that quilt and sleep like a pigeoned toed little girl! Lovely projects! Great work, great ideas, well done! Thank you for sharing. Such beautiful projects. I love them all especially your quilt. Fabulous work! Love the doll quilt!!!! Great stitching! That is a great quilt! 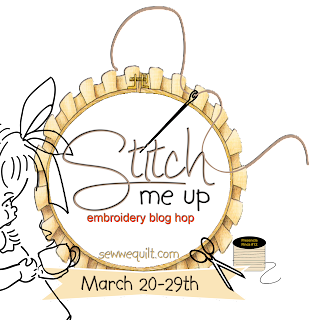 All your stitching projects look fantastic. I really love the ironing gal! Your creations are wonderful! Love the quilt...your stitcheries are fabulous! Love everything! I love the quilt! It is just so perfect with those beautiful stitcheries! Cute idea with the paper doll girls. Your stitching is lovely and wish I could do it just like you. Love all the little girls, Mdm Samms design and the paper dolls, in your quilt. Great job. great projects! Thanks so much for sharing! All your projects are wonderful! All of your projects are terrific. I always love Wee Tots and that ironing number really tickles me though I can't say why. Thanks for sharing. Wonderful projects! And I adore your Wee Tots quilt. Such a lovely idea! 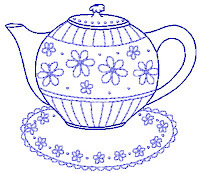 Funny, I paused before reading your post, so that I could pour a cup of tea. Perfect! (both the tea, and your cute embroidery). Lovely work! Your stitching pieces are wonderful! 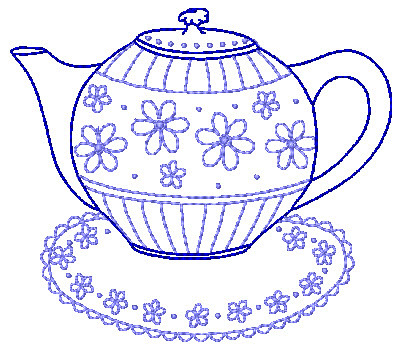 I especially love your teapot! Thanks for sharing them all. Such lovely stitcheries! Your wee tots and friends are adorable! Very well done!